Bon Appétit's article about the booze in Breaking Bad got me thinking about making a cocktail to honor the show, AMC's dramatic series about a high school chemistry teacher turned drug kingpin that concludes its 6-year run this weekend. Here then is The Heisenberg, named after Walter White's alter ego that has increasingly consumed the good man White once was. 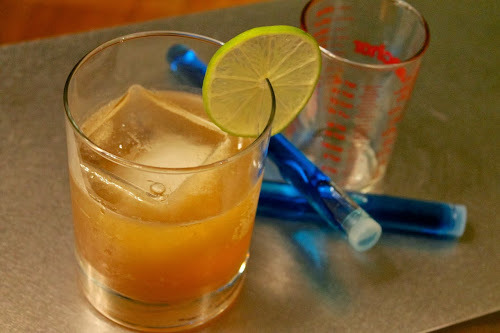 As Bon Appétit points out, whiskey shows up during key scenes in the show, so I used Knob Creek rye as this drink's foundation and drew inspiration from the show's geography for the rest: habanero shrub, as a nod to the show's New Mexico setting; Becherovka, as a tip of the hat to the Czech Republic, where White's meth is a big seller; and maple syrup to represent New Hampshire, an important setting near the end of the show. Even the lime wheel is an ode to the show's distinctive green logo. Combine whiskey, Becherovka, maple syrup, bitter and lime juice in a shaker with ice. Shake until cold. Strain into a rocks glass with ice. Garnish with lime wheel. Delicious drink, and I love those blue vials in the pic!